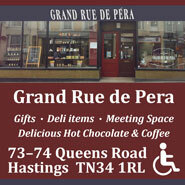 One side of the double-sided sign at the Robert de Mortain pub – see below for the other. 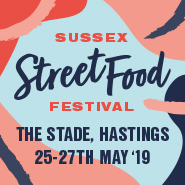 In September 1066 William the Conqueror landed on the East Sussex coast from Normandy and in October his victorious army confronted King Harold in the Battle of Hastings, arguably the most famous conflict on British soil. The decisive event was the death of King Harold, who was killed by an arrow in his eye. The 950th anniversary of this event was celebrated this year in Hastings and in the town of Battle about seven miles away. Hastings’ newest pub, The Conqueror’s March , was opened in July this year and is named after the alleged route taken by William’s army from Hastings to the site of the battle in 1066. 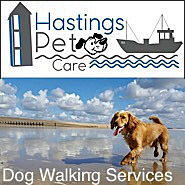 However, as you might expect, it is not the first pub with a name referring to the Battle of Hastings and there are several others in the area. 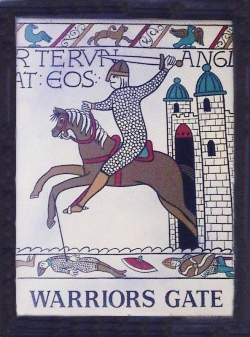 These are or were: Warrior’s Gate and the Norman Arms in St Leonards, Royal Standard and Robert de Mortain in Hastings, Abbey Inn, The 1066 and the Senlac in Battle, and last but not least William the Conqueror (the ‘Billy’), a few miles away at Rye Harbour – there is a second pub of the same name in Iden village to the north of Rye. The original Norman Hotel and Tavern opened after 1845. 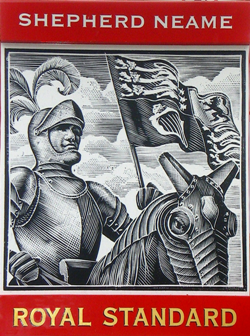 This was 20 years before the completion of Warrior Square — another name connected to William the Conqueror. The pub was designed by ‘the builder Voysey in 1845’ and is listed in the Hastings Directory for 1855. An early pub sign simply said The Norman, underneath Watneys Red Barrel. 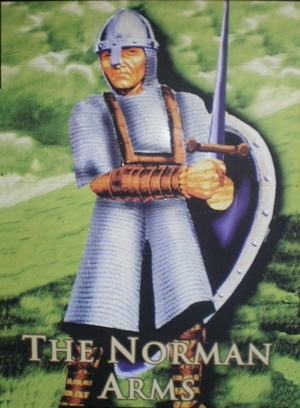 The most recent sign, last seen in the cellar, depicts a Norman soldier. It was the only local pub sign made of fibreglass, and according to a recent landlord the original image was downloaded from the internet. Latterly known as the Norman Arms, the pub closed in 2013. This pub opened in 1948 and is located on The Ridge. 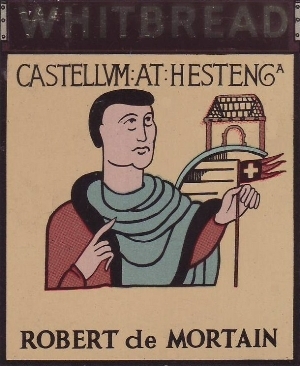 It is named after Robert de Mortain, half-brother of William the Conqueror, who is thought to have been responsible for building Hastings Castle. 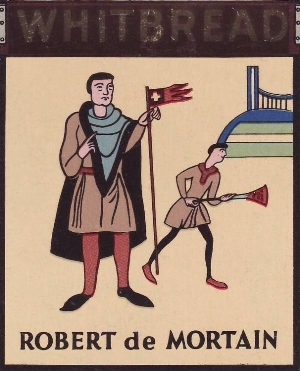 In a section of the Bayeux Tapestry, Robert Count of Mortain sits on the left-hand side of his half-brother, William Duke of Normandy, (William the Conqueror). Robert’s full brother Odo sits to William’s right, implying his seniority. This scene is thought to be somewhere local. In the 1950s the double-sided sign was included in Whitbread’s miniature inn sign series. 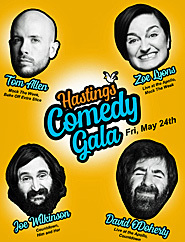 It was designed by Violet Rutter who also designed other Hastings Whitbread signs. 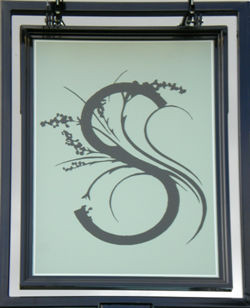 The current sign is a bland Green King multiple. The Royal Standard started life as a fishing pub opposite the Stade in 1822, although the deeds of the building date back to 1707. 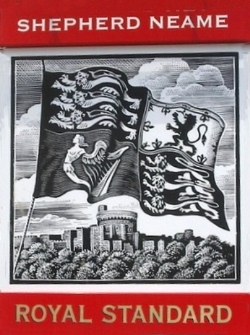 The name Royal Standard usually depicts the flag of Queen Victoria. The first sign, left, shows the flag of King Harold, used in the Battle of Hastings before he was defeated by the Normans. Therefore it was unique to Hastings. It was replaced by the second sign a few years ago. One of St Leonards’ earliest pubs, the St Leonard, formerly the Warrior’s Gate, opened in 1833. 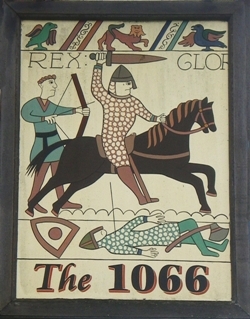 Its last two pub signs referred to the Norman invasion as portrayed on the Bayeux Tapestry. The tapestry is an embroidered cloth 70 metres long by 50 centimetres high, which depicts the events leading up to the Norman Conquest. Commissioned by William’s half-brother Odo nine centuries ago, it is on display in Normandy. 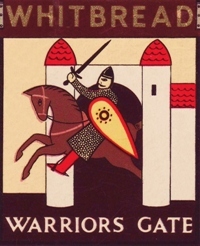 The Whitbread’s sign was included in their collection of miniature inn signs after the Second World War. The Warrior’s Gate closed in 2006 and reopened as the St Leonard in 2012. St Leonards’ post office now stands on the original site. The 1066 pub on Battle High Street was formerly known as the Star but is now a Costa Coffee house situated opposite Battle Abbey. It closed in 2012 after a fairly long life dating back to the 1850s. The land on which it stands belongs to the Battle Abbey estate which covers an area of one league or three miles. Prior to the 1850s it was a farm supplying the monks and the local population. Its well-known sign was yet another influenced by the character and genre of the Bayeux Tapestry. This sign and the first sign of the Warrior’s Gate in St Leonards were probably painted by the same artist. The Abbey Hotel is located opposite Battle Abbey and dates from at least 1890. 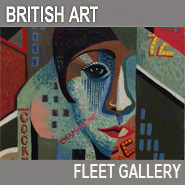 It is the second licensed premises on the Abbey estate and is tied to the Shepherd Neame brewery of Faversham, Kent. The Shepherd Neame brewery was founded in 1698 and evidence shows that brewing has taken place on that site since 1573, making it the oldest brewer in the United Kingdom. The brewery has 328 tied pubs and hotels in Kent, London and the south-east and is famous for Spitfire and Bishops Finger ales, among others. Senlac Hill, now the site of Battle Abbey, is the location where Harold deployed his army for the Battle of Hastings. The name Senlac was created and popularised by the Victorians and was almost certainly unknown to the Normans. It was the name of a local stream known in French as ‘Sanguelac’ which translates into English as ‘Blood Lake.’ The stream forms the basis of a local legend which describes a large ditch where many soldiers of both sides fell and were trampled to death, turning the stream red with their blood. To this day it is said that the soil in this area turns red after a heavy rainfall! The inn is situated on the junction of Station Approach and Battle Hill. 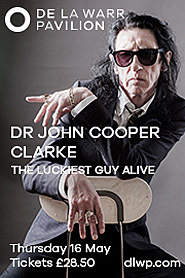 Presumably the designer of the sign was unaware of the legend! This pub has been located at Rye Harbour since the 1820s. In the 1850s the pub was owned by the South-Eastern Railway Company and sold by them in 1859. 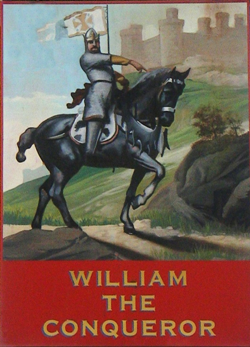 A previous sign, a portrait of William the Conqueror, became well-known after it was included in a series of coloured lantern slides of the area taken by John E Ray, ‘a solicitor of Hastings and Bexhill’, before the Second World War. That sign was replaced by the sign shown here, at a date unknown. A second pub of the same name once stood in the village of Iden to the north of Rye from 1826, but closed down some years ago. 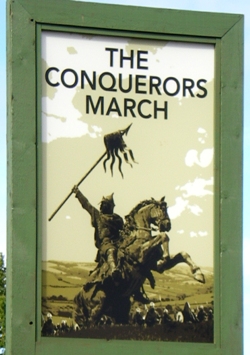 The Conqueror’s March in Westfield is the newest pub in the Hastings area. 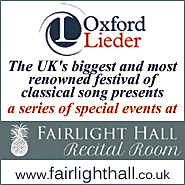 It opened in July 2016. A history of The pubs of Hastings and St Leonards by David Russell, with photos by Lynda Russell, is available from local bookshops or from www.hastingspubhistory.com. 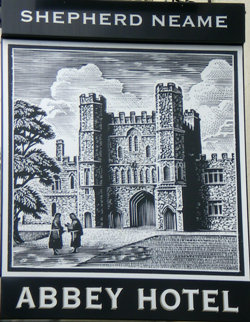 David and Lynda have also collaborated on histories of the pubs in both Lewes and Rye.